Fits perfectly with applicable tube sizes! Detects liquid and air bubbles without fail! (Note) Sensing air gap refers to the width of an air bubble formed in the entire area of the inner diameter of the tube. Please note that this product cannot sense very small air bubbles or water drops. ">0.8 mm 0.032 in or more(Note) Sensing air gap refers to the width of an air bubble formed in the entire area of the inner diameter of the tube. Please note that this product cannot sense very small air bubbles or water drops. Liquid(Note) Sensing is affected by dirt or residues adhered to the inner wall of the tube. Please maintain the tube regularly. (Note) When using a tube out of specifications or it doesn't have a smooth surface, please test sensing on the actual machine before use. 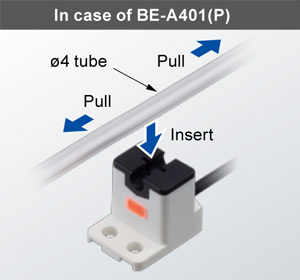 ">ø4 mm × ø2.4 mmø5/32 in × ø3/32 in(Note) When using a tube out of specifications or it doesn't have a smooth surface, please test sensing on the actual machine before use. Transparent resin tube (equivalent to flexible PVC)(Note) When using a tube out of specifications or it doesn't have a smooth surface, please test sensing on the actual machine before use.Transparent resin tube (equivalent to PFA)(Note) When using a tube out of specifications or it doesn't have a smooth surface, please test sensing on the actual machine before use. 20 μs or less(Note) Actual response time may differ from specification (typical example using applicable tube) due to dimension, light transmission or surface state of test tube in use.30 μs or less(Note) Actual response time may differ from specification (typical example using applicable tube) due to dimension, light transmission or surface state of test tube in use. 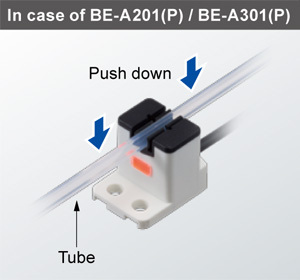 (Note) Actual response time may differ from specification (typical example using applicable tube) due to dimension, light transmission or surface state of test tube in use. Simply attach the sensor with your hand! Hassle-free one-touch attachment without using tools! Push down the tube into the sensor. Stretch the tube and insert it into the sensor.